The climate-change problem is essentially one of accumulating stocks of greenhouse gases (GHG) in the atmosphere. Economic behaviour and the availability of fossil fuels have led to greatly increased greenhouse gas emissions from human activity, and the unrestrained future increase in emissions is likely to end in dangerous climate change. Figure 1 shows the expected increases in GHG emissions from a wide range of Intergovernmental Panel on Climate Change (IPCC) scenarios. The reason to be pessimistic about future emissions (IPCC 2007c, Fourth Assessment Report, AR4) is that there are very substantial reserves of fossil fuels, especially coal, available at prices that make them economic for power generation, even more so with the higher levels of gas prices seen in recent years, gas being one of the main alternative fuels. Adding to the economic pressure to use coal, there is a political pressure for countries that might otherwise be importing gas, to use domestic coal to maintain or increase energy security. Deforestation also contributes to the emissions, but the motivations and institutional behaviours here are more complicated. There is a very long-term global trend in the loss of virgin forests and grasslands, also arising from their availability as common resources, so that their destruction for land or timber benefits individuals but the loss of the resource and the climate-change costs are collective. Knowledge about the potential impacts of climate change is provided by both The Stern Review (2007) and the IPCC 2007 Working Group 2 (IPCC, 2007b) Report. The first impacts of anthropogenic climate change appear to be already evident in the European heat wave of 2003, the Katrina hurricane of 2005, and the widespread fires in Greece and California in 2007 - although variation in weather events makes attribution difficult. These events are all consistent with higher average temperatures and more energy in the atmosphere as a result of higher greenhouse gas (GHG) concentrations. The attribution of such extreme events to global warming is supported by the unexpectedly high increase in CO2 concentrations reported by Raupach et al, 2007, in turn attributed to faster-than-expected global economic growth and the increased use of coal in China and other developing countries for electricity generation. The important feature of future climate change that leads to the damages is the expected increase in frequency and severity of extreme climatic events over the next millennium at least. The average temperatures and sea level rises should be seen as indicators of the risks of such events, rather than as widespread small and gradual changes. What may appear to be a favourable outcome, e.g. a milder climate in northern Europe, may turn out to be more variable winters and summers, with more floods and droughts. As the temperatures go up, the frequency and severity of the extreme events seems likely to rise too. The problem of scientific reticence (Hansen et al, 2007) means that the underlying situation may be much more serious that portrayed in the last IPCC Report. The economics of the problem suggest that the risks to human life and health, along with the escalating value of the net loss of life and health without discounting, imply unbounded costs of business as usual. The IPCC Fourth Assessment Report (AR4) WG3 Summary for Policymakers (2007a) gives an indication of just how deep the cuts will have to be to avoid risks of catastrophe. It presents six scenarios from the literature on the scale of action required. For a chance less than 50:50 that the target will be met, the scenarios suggest that global CO2 emissions will have to be between 50% to 85% below 2000 levels by 2050, and becoming negative (through sequestration and storage) by 2070 and beyond. Therefore to be reasonably sure of avoiding dangerous climate change defined as a 2 °C rise or less, the world should be aiming for complete decarbonisation by 2050 or earlier. All sectors in all countries should be aiming to stop emitting GHG into the atmosphere as soon as possible without excessive cost. We should be considering just how fast economies can reduced their emissions without any serious damage to government, business and household finances. 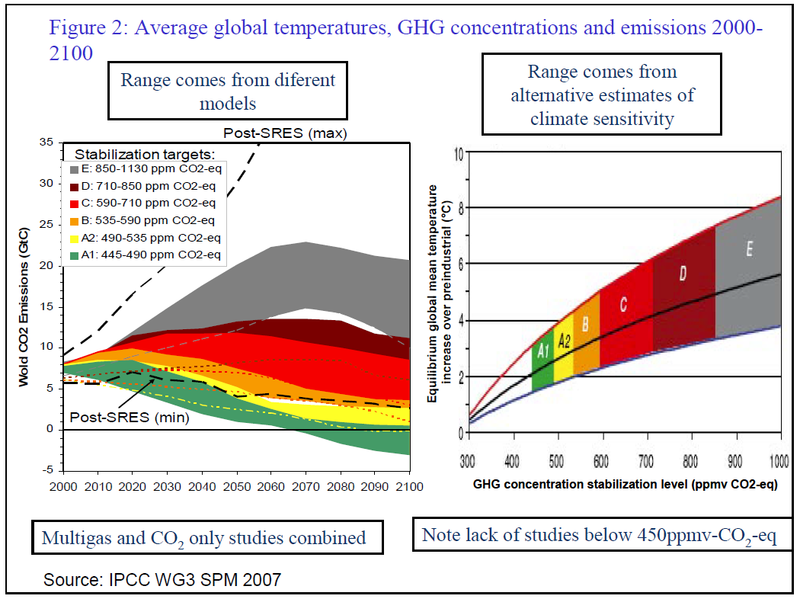 Figure 2 from the Report shows the ranges from assumptions about climate sensitivity in converting from temperatures to GHG concentrations, and the implications of the concentrations for the GHG emission trajectories 2000-2100, with the range coming from the different models’ estimates. The link between the two charts in Figure 2 comes through the colour coding for groups of scenarios. Note that there are no estimates below about 450ppm CO2-eq, because there were too few studies in the literature for a reliable estimate. The damages are likely to rise steeply as average temperatures rise over the next century. The costs rise as the damages to life and health increase for the rich, who can afford to protect themselves, and far more so for the poor. The CBA solution in this case is one of costs so high that immediate and instantaneous elimination of all GHG emissions is justified as well as the use of all our resources in a massive programme to remove CO2 from the air. This of course in not going to happen and I agree with Marty Weitzman (2008) that this makes CBA meaningless and useless. 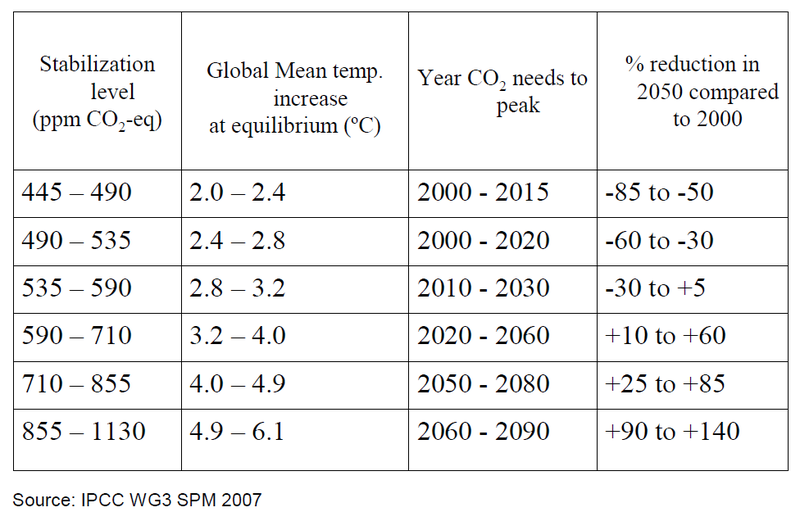 Figure 3 shows various targets for climate stabilisation in terms of temperature increases above pre-industrial levels, and GHG concentrations in the atmosphere in CO2-equivalent parts per million (ppm). The current level is about 430ppm CO2-eq, but this is affected by SO2 and other non-GHG emissions that have a net cooling effect. 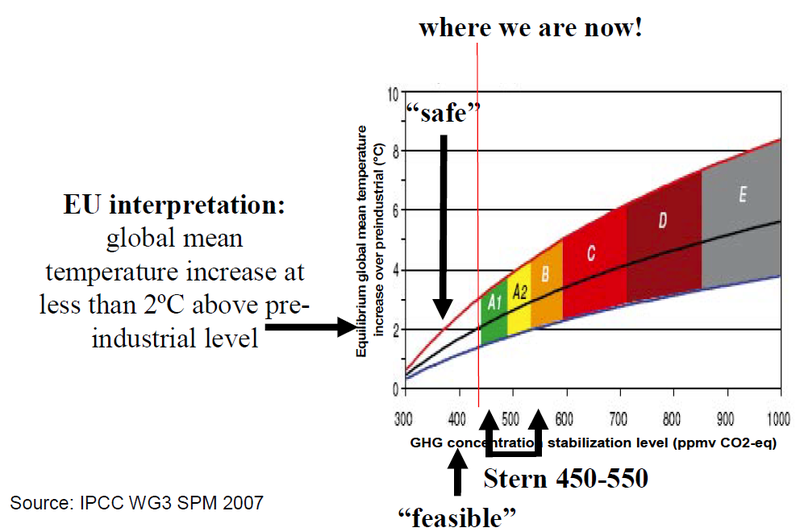 The Stern Review range is 450-550ppm CO2-eq, but a feasible level for scientific study is assumed to be 400ppm CO2-eq, whilst the safe level for the 2 °C target, allowing for climate sensitivity, would be more like 380ppm CO2-eq (Hansen et al, 2008). So we must re-direct our economic thinking towards a risk assessment. The central question for climate policy is how to reduce all damaging emissions from human activity as soon as possible, recognising the risks and uncertainties and the opportunities for improving human well-being. In the atmospheric emissions with GHGs, I include soot, other fine particles, SO2 and the chemical surfaces of the particles (as well as the chemical soup cooked up by the sun and weather) as an inherent part of the problem and their reduction as an inherent part of the solution. Luckily for us, the biosphere appears to absorb about half our current GHG emissions, so if we stop emissions altogether (very unlikely, but an iconic target) then concentrations will fall. However, this feature of the carbon cycle is weakened by the higher temperatures, ocean and forest acidification and pollution, so we risk damaging this natural service as well, making the problem worse. The reduction in other pollutants associated with GHG emissions is important because the literature suggests that this side benefit of GHG mitigation may be substantial, indeed comparable with the direct costs of the mitigation (Barker et al, 2007, section 11.8). Fortunately these do not accumulate, but get washed out of the air much sooner than GHGs, so that abatement has immediate benefits in terms of improved air quality. Table 1 shows the reductions in emissions required for the different target ranges. For the most stringent range shown of 445-490ppm CO2-eq, GHG emissions have to be at least 50% below 1990 levels by 2050, preferably much more and much earlier, and emissions have to peak before 2015. We need short-term modelling to explore the costs and benefits of accelerated decarbonisation of the global economy, so I am very taken with Klaus Hasselmann’s call for an international forum to be established to provide information and help to explore details of the economic solutions (Hasselmann and Barker, 2008). Carbon trading is one of the critical policy instruments in that solution, which brings me to the main theme of my talk. Political economy has been portrayed by Thomas Carlyle as the dismal science, but on the contrary, I am heartened by the fact that a new understanding of the economy leads me to assert that it need not cost much, and if we choose a good mix of policies such action will benefit economic performance and improve human well being. Just as Malthus was wrong (so far!) in his predictions of population growth leading to economic collapse (Trewavas, 2002), so I think traditional economists are wrong in arguing that rapid decarbonisation will ruin our economies, and for much the same reasons: technological change, but with a twist. In addition to food-producing technologies to feed us (“the green revolution”), we now need GHG-reducing technologies with carbon trading and carbon taxes “to save the earth”, by which I mean initially the coral reefs and tropical forests, these treasures of biodiversity evolved over millions of years of climate stability, but ultimately the favourable climatic conditions that have allowed life to flourish on earth. Of course this depends on the mix of policies available, but we can find a clue to the scale of feasible reductions from the studies of the costs of ratifying the Kyoto Protocol for the USA. These postulated a 30% reduction in CO2 emissions below business as usual over a 3 to 4 year period. With US emissions more or less static, this in turn implies a reduction of some 7% a year (Barker and Ekins, 2004). I shall discuss later how much this might cost. The major problem for climate policy is that the atmosphere is a common resource, which makes the problem almost intractable and the outlook for effective action bleak. As Stern says, the use of the atmosphere for waste disposal represents the greatest market failure the world has ever known. In the economic behaviour underlying economic growth and development, no government, business or household has a direct self-interest in reducing emissions. Each has an interest in using the atmosphere as disposal of the waste gases of combustion, but action by any single group in reducing its waste, even the USA, will have a very small effect on the global stock. Cooperation with others is necessary to reduce costs and achieve substantial reductions. 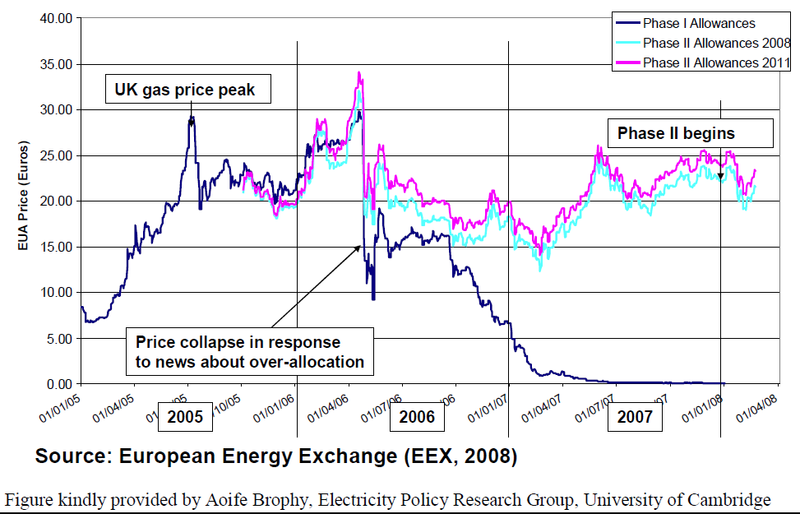 Figure 4 shows the carbon prices as they have emerged in the scheme over the three years 2005-2007 covering Phase 1 of the ETS. 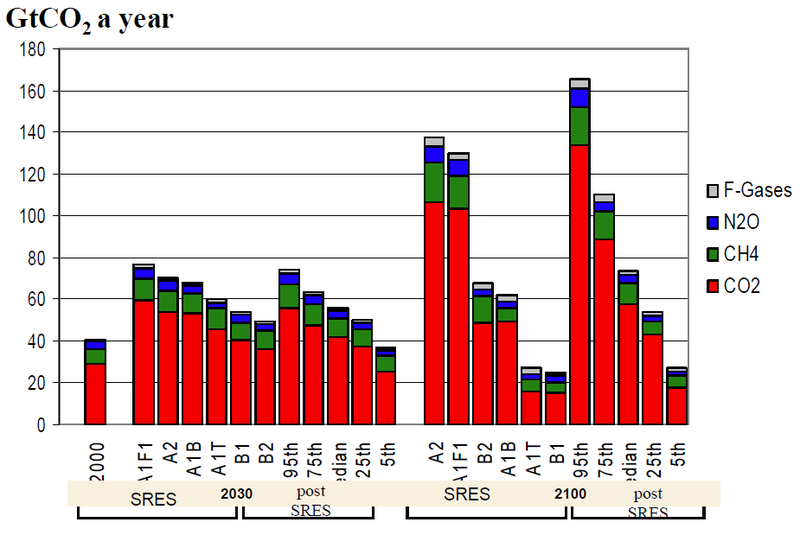 It shows the actual prices of Phase 1 and the future prices for use of allowances in 2008 and 2011 during Phase 2. The future prices move together and have averaged between €20 and €25 per tonne of CO2. It is in this context that I should like to consider carbon trading. The European Union’s Emission Trading Scheme (EU ETS) for CO2 emissions is by far the largest and most comprehensive action yet taken in mitigation policy. It has the potential to achieve the 2 °C target, but it will have to become global and incorporated within national policy portfolios including regulation and perhaps ecotax reform if it is to be effective, efficient and equitable in doing so. The role of the carbon price generated through trading is pivotal in realising the mitigation potential in all sectors. The carbon price re-enforces the effects of regulations improving efficiency standards in vehicles, appliances and buildings. It suggests the appropriate levels of carbon taxation for the non-traded sectors in an environmental fiscal reform. It induces technological change, because investment in low-carbon technologies is increased and costs fall as their scale rises, leading to more take-up of the technologies. Finally, at a global scale, it offsets the cheapening effect of increasing energy efficiency on the real costs of using energy, and so offsets any potential rebound effects (Sorrell, 2007). The earlier and stronger the actions to make the future carbon prices sufficiently high and reliable, then the higher are the investments and the lower the eventual costs. The main reason why technology alone is very unlikely to solve the mitigation problem is this “rebound effect” (Sorrell 2007). This effect comes about through improvements in energy efficiency leading to reductions in costs of a technology, which then leads to higher use, so that the energy-saving from the technological improvement if offset by increased demand for energy. Therefore any technological breakthrough without a carbon price to deter extra use of carbon will lead to higher incomes and more use of energy in general, weakening the effect in reducing GHG emissions especially at a global level. A carbon-price signal is needed to provide a pervasive and long-term signal for investment decisions so that low-GHG options are chosen. Most important, the R&D decisions would also be influenced by the expected carbon price. Basically the low-cost trajectories towards stabilization in the literature involve the strong expectation that carbon prices will rise to very high levels, so that new investments (supplying energy in the form of power plants and demanding energy for power, comfort, light and transportation) are designed, deployed and installed as low-GHG depending on their lifetime. The low carbon price in the near term reduces the cost of premature obsolescence; the expectation that they will be high later encourages R&D and investment in long-lived low-GHG capital, and reduces risks of lock-in. The outcome should be seen in terms of rapid adaptation of the energy system to low or negative GHG emissions without excessive costs and making the most of the no-regrets technical (e.g. in dwellings) and institutional (environmental tax reform) opportunities and the potential for induced technological change. If the policy is successful eventually no sector will need to pay for carbon because the emissions will cease, but the price signal must be credible and should escalate to give time for adjustment. Carbon prices are social prices with their levels generated by policy through two main market-based instruments to manage the climate problem: carbon taxes and emission-permit schemes. A carbon tax is a highly specific and targeted way of tackling the global warming problem: the necessary fiscal system is already largely in place, the administrative and compliance costs are exceptionally low compared with those of many other taxes, the tax revenues will tend to grow with incomes, and the expected responses to higher prices are such that revenues will continue to rise even as there is substantial erosion of the tax base as emissions decline. However taxes are disliked, particularly by the energy industries. In contrast, the externality can also be managed by creating a market in legally enforceable rights to emit GHGs, such as the EU ETS and then restricting those rights, and auctioning all or part of them. The rights or allowances can be given to the emitters as an incentive to participate, as in Phases 1 and 2 of the EU ETS, a crucial advantage compared to taxes. The schemes, in contrast to carbon taxes, provoke an institutional response in that a new market is created, and companies tend to seek out new ways of reducing emissions. However, there are several objections to such schemes: they acknowledge rights that may not have existed up to that point, no actual monetary compensation is normally provided for those who will suffer damage from future pollution, the schemes are open to abuse by collusion, and transactions costs can be high, especially for small non-business sectors. So far the schemes have been confined to cover large fixed business uses of carbon, predominantly power generation. This brings me to the issue of what level of long-term carbon prices is needed to decarbonise the global economy. This question cannot be answered with any certainty because the underlying literature is insufficient in quantity and quality. In any case we should refer to a range of prices to achieve a quantitative target, which itself is chosen by taking into account the risks and uncertainties of not achieving the target. And, crucially, we should keep in mind that business as usual is the most dangerous and risky of the options available in the literature. There are prices around. The most recent results for the UK, are given in a report for the 2007 Energy White Paper (Strachan et al, 2007). The Shadow Price of Carbon from this report to achieve a 60% reduction in CO2 by 2050 below the year 2000 levels is £65 to £176/tCO2 (year 2000 prices) by 2050 with a central estimate of £105. At year 2000 exchange rates the range converts to $98 to 267 with a central estimate of $159 for 2050. As an aside, contrast this price with that proposed by Defra (Price et al, 2007), converted to the same basis, of $76 (£50)/tCO2 by 2050. The Defra price was chosen not on the basis of achieving the 60% target, let alone the 2˚C target, but from a cost-benefit analysis with an outdated estimate of the costs of climate change that substantially discounts the value of health and lives of future generations and ignores the significant risks of catastrophe. Although no one pays the shadow price, it does enter the cost-benefit analyses of major projects, such as the third runway at Heathrow airport, and may affect planning decisions, such as those for the proposed coal-fired power station at Kingsnorth on the Thames estuary. The current Defra price of half or less than the one from more relevant modelling seems likely to undermine the achievement of UK CO2 targets. The global carbon prices required to reach the 2 °C target The global carbon prices required to reach the 2 °C target are not in the literature, but we can extrapolate from what is available at least at ranges that may achieve the 450ppm CO2 -eq, the most stringent level recommended in the Stern Review. Barker and Jenkins (2007) estimate a range of $24 to 173/tCO2 -eq year 2000 prices by 2030, depending on the treatment of technological change in the models, with the lower value assuming a technological break-though in the form of a low-cost, low-carbon source of energy in unlimited supply (a “back-stop” technology). As a rule of thumb, given all the uncertainties and a precautionary approach, a carbon price rising to $100/tCO2 -eq by 2020 for OECD countries seems to be a good starting point. This could emerge from emission trading schemes for the energy sector with a stringent GHG reduction target by 2020 of at least 30% below 1990 levels by 2020. Such a carbon price is a market price similar to the world oil price, but applying mainly to CO2 emissions from electricity generation. It converts to $45/barrel of oil and would be paid on CO2 emissions from burning coal and gas (the electricity sector does not use much oil for generation), essentially raising electricity prices (by 70% in the US on year 2005 fossil-fuel use). However, there is a the crucial difference compared to 2007-2008 oil-price increases on a similar scale: the increase in carbon prices would be spread over several years and the revenues from auctioning the emission allowances would accrue to the countries regulating the emissions, not to the oil producers, and so they can be used to compensate those who lose employment and to provide incentives for low-carbon alternative sources of energy. If the energy sector responds rapidly and switches to renewables, nuclear and other low-carbon sources, then the CO2 allowance costs will fall rapidly. However, emission trading schemes are less suitable for other sectors, especially for emissions from transportation and buildings, and wider portfolios of policies, in which institutional and technical barriers to change are addressed, are more appropriate. The literature on mitigation is concerned mainly with quantitative GHG targets, as required by any stabilization target, which has to be absolute in relation to the prospective stocks of GHGs in the atmosphere. However, the economic system driving the emissions is market-based, in which prices play a critical role in allocating resources and encouraging technological change. The low-cost policies all require the use of market instruments via carbon prices, combined in portfolios with regulation and subsidies targeted at clear market failures, most critically the pervasive general market failure in innovation and the specific market failures in the energy markets (e.g. achieving more rapid penetration of hybrid and plug-in vehicles, or exploiting no-regrets options in buildings). The market failure in innovation comes about because those doing the investment, even allowing for patents, are unable to capture all the benefits, which accrue to all those able to copy and exploit the innovation. In consequence not enough innovation is done in a market system (Jaffe et al, 2005). Governments usually have a wide range of policy instruments at their disposal to achieve their targets for climate policy. Indeed, the focus of the IPCC WG3 Report is on the sectoral options for mitigation (7 out of 13 chapters), providing a rich source of detail on the economic potential for mitigation at different carbon prices in energy, transport, buildings, industry, agriculture, forestry and waste management. Good policy portfolios for GHG mitigation will be specific to each country depending on their political systems, the available renewable and other energy resources and the energy efficiency of the stocks of buildings and equipment. Such portfolios will combine policies and measures to produce outcomes that are effective at achieving the main objective, efficient with low costs, or even benefits, as regards effects on GDP, and equitable in that the most vulnerable groups affected will be most likely to benefit. Most important for policies to achieve a wide social consensus, they should also address other potential social benefits, such as improvements in air quality with the associated better human health and higher crop productivity, the increased comfort from better insulated buildings, or reductions in traffic-related pollution. It is a great advantage that climate policies, both for adaptation and mitigation, are inherently equitable. This is because mitigation has its main and central benefit the avoided costs of climate change and adaptation also avoids the effects of climate change. The climate change damages are focused on those who cannot re-locate or otherwise protect themselves against climate-related damages, i.e. those on low incomes, especially in developing countries with relatively large agricultural sectors in flood plains or drought-prone regions. However, there are major exceptions, e.g. energy use per capita may be particularly high in low-quality dwellings occupied by low-income households. In such cases the portfolio should include measures to improve the energy efficiency of dwellings. One complement to the market-based carbon prices is the use of the traditional regulatory command-and-control approach, which involves agencies (such as Pollution Inspectorates) fixing and forcing energy and GHG standards. Climate, air quality and energy-security objectives are all served by technology-forcing policies of the sort pioneered in California over the past 15 years (Jänicke and Jacob, 2004). The main objection has been their potential inefficiency, but they can be targeted to correct market failures and support investments that are profitable given social as opposed to private costs and discount rates. There is one particular benefit that may be important for economies with chronic problems of unemployment or underinvestment: the potential use of the revenues to reduce taxes that bear on employment and investment. The distortions of the current tax system may be so great that a large number of jobs could be created, at no net fiscal cost and at little risk to inflation, by a reform of the tax system (Patuelli et al, 2005). This is feasible because a 60 percent cut in emissions is only 2.3 percent a year over 40 years. If the price incentives are in place, especially if they can be anticipated, the economy can move gradually and efficiently towards a sustainable level of emissions without sacrificing economic welfare. However, this requires the use of efficient instruments such as the carbon tax, and it also requires social acceptance of long-term radical change, in which people with a preference for carbon-intensive lifestyles are liable to lose out. Before I finish, I would like to give an estimate as to how much this will cost. This is a surprisingly difficult and controversial issue because economists are by no means agreed on how to represent and model these costs. We can find one estimate of these sectoral costs from the price of the allowances times their number, since this is what has to be paid to achieve a target if all the allowances are auctioned. Thus if we expect total UK CO2 emissions to be 30% below 2000 levels by 2020, the revenue (assuming prices of £66/tCO2 converted from $100/tCO2) would be £25bn in 2000 prices. It is important to put this into perspective. Total UK environmental taxes were £35bn in 2005, current prices, representing 7.7% of total tax and social security revenues. In other words, the revenues from CO2 emission trading are likely to be less than 10% of total tax revenues, even at the $100 carbon price for 2020. However, these costs are one-sided and partial. They show what the system is projected to pay for the rights to emit CO2, but do not take into account the wider picture. These costs are also simultaneously revenues for the government that can be used to support alternative low-GHG technologies or to reduce burdensome taxes. A more complete assessment of costs is given by a macroeconomic analysis. The macroeconomic costs To give a flavour of the likely costs, we can look at the studies of the costs of the US ratification of the Kyoto Protocol (Barker and Ekins, 2004). The US government published a study for the US reducing CO2 emissions by 30% over 3 to 4 years, and reported costs of about 1% of GDP under Kyoto trading. Other studies showed benefits, especially if the reductions in air pollution are included. Furthermore I expect that technological change will accelerate and costs fall sharply as the scale of effort moves towards 100% reduction. The traditional, equilibrium thinking arguing that GDP costs will rise as the scale of effort rises does not take induced technological change and developing countries’ underemployment into account. Although mitigation can reduce climate change and the need to adapt, the inertia in the climate system, as a result of the long lifetime of CO2 (the main greenhouse gas) and the slow response of the oceans, means that adaptation will be necessary. There is also a risk that the international co-operation required for successful mitigation will not be achieved. The Stern Review and the IPCC Reports in 2007, together with the experiences of early pilot mitigation policies in the European Union and its Member States, have provided the information and analysis sufficient for global policies to be developed. And the reception of the reports suggests that the seriousness and magnitude of the problem is recognized and that the key messages have been understood more generally. However, effective action requires an unprecedented co-operation of policies by the very large emitters involving many governments world-wide acting urgently. This is almost unprecedented, with the success of the Montreal Protocol on ozone depletion giving the best indication of the way forward. and R&D funded from tax revenues and emission permit auctions. Such portfolios of market-based instruments can be made even more effective if complemented by technological forcing via standards, such as a requirement for carbon capture and storage by a specified date on all new coal plant. There is also evidence from energy-efficiency studies that many sectors, particularly buildings, have substantial opportunities for no-regrets mitigation, requiring tailored policies to reduce or remove barriers, with the policies often led by higher enforced standards on energy efficiency. Carbon trading has a crucial role to play in these portfolios by establishing market prices for CO2 emissions to achieve CO2 reduction targets. These prices can provide the signals for the scale of action required in the whole economy. The way forward is in international agreement to establish a global carbon market, with the ultimate aim of decarbonising the global economy. A good starting point is a scheme covering international activities such as aviation and shipping, with a cap-and-trade scheme to achieve zero net emissions by 2050, and auctioning of revenues to support low-carbon alternatives to fossil fuels in developing countries through a greatly expanded clean development mechanism. Such a scheme, if well managed, could provide a strong, rising and predictable carbon price to provide the signal for more general national and international action. Barker, T. (2008), ‘The economics of avoiding dangerous climate change: an editorial essay’. Special Issue of Climatic Change on “The Stern Review and its Critics”, forthcoming. Barker, T.; Bashmakov, I.; Alharthi, A.; Amann, M.; Cifuentes, L; Drexhage, J.; Duan, M.; Edenhofer, O.; Flannery, B.; Grubb, M.; Hoogwijk, M.; Ibitoye, F. I.; Jepma, C. J.; Pizer, W. A.; Yamaji, K. (2007), ‘Mitigation from a cross-sectoral perspective’, In Climate Change 2007: Mitigation. Contribution of Working Group III to the Fourth Assessment Report of the Intergovernmental Panel on Climate Change [B. Metz, O. R. Davidson, P. R. Bosch, R. Dave, L. A. Meyer (Eds. )], Cambridge University Press, Cambridge, UK. Barker, T.; Ekins, P. (2004), ‘The costs of Kyoto for the US economy’, The Energy Journal, 25 (3), 53-71. Hansen, J. E. (2007), ‘Scientific reticence and sea level rise’, Environ. Res. Lett., 2, 024002, doi:10.1088/1748-9326/2/2/024002. Hasselmann, K.; Barker, T. (2008) ‘The Stern Review and the IPCC Fourth Assessment Report: implications for interaction between policymakers and climate experts’, Special Issue of Climatic Change on “The Stern Review and its Critics”, forthcoming. IPCC (2007a), ‘Summary for Policymakers’, In: Climate Change 2007: The Physical Science Basis. Contribution of Working Group I to the Fourth Assessment Report of the Intergovernmental Panel on Climate Change [S. Solomon, D. Qin, M. Manning, Z. Chen, M. Marquis, K.B. Averyt, M.Tignor and H.L. Miller (Eds.)]. Cambridge University Press, Cambridge, UK. IPCC (2007b), ‘Summary for Policymakers’, In: Climate Change 2007: Impacts, Adaptation and Vulnerability. Contribution of Working Group II to the Fourth Assessment Report of the Intergovernmental Panel on Climate Change [M.L. Parry, O.F. Canziani, J.P. Palutikof, P.J. van der Linden and C.E. Hanson, (Eds. )], Cambridge University Press, Cambridge, UK, pp 7-22. IPCC (2007c), ‘Summary for Policymakers’, In: Climate Change 2007: Mitigation. Contribution of Working Group III to the Fourth Assessment Report of the Intergovernmental Panel on Climate Change [B. Metz, O. R. Davidson, P. R. Bosch, R. Dave, L. A. Meyer (Eds. )], Cambridge University Press, Cambridge, UK. Jaffe, A.; Newell, R.; Stavins, R. (2005), ‘A tale of two market failures: Technology and environmental policy’. Ecological Economics, 54, 164-174. Jänicke, M.; Jacob, K. (2004), ‘Lead Markets for Environmental Innovations: A New Role for the Nation State’, Global Environmental Politics, 4:1, 29-46. Patuelli, R.; Nijkamp, P.; Pels, E. (2005), ‘Environmental tax reform and the double dividend: A meta-analytical performance assessment’, Ecological Economics, 55 (4) 564-583. Sorrell, S. (2007), The Rebound Effect: an assessment of the evidence for economy-wide energy savings from improved energy efficiency, UK Energy Research Centre, October. Stern, Nicholas (2007), The Economics of Climate Change: The Stern Review, Cambridge University Press, Cambridge, UK. Strachan, N.; Kannan, R.; Pye, S. (2007), ‘Final report on DTI-Defra scenarios and sensitivities, using the UK MARKAL and MARKAL-MACRO energy system models’, PSI, London, May. Trewavas, A. (2002), ‘Malthus foiled again and again’, Nature, 418, 668-670 (8 August 2002) | doi:10.1038/nature01013van den Bergh, J. C. J. M. (2004), ‘Optimal climate policy is a utopia: from quantitative to qualitative cost-benefit analysis’, Ecological Economics, 48, 385-393. Dr Terry Barker is an economist. He is Director of the Cambridge Centre for Climate Change Mitigation Research (4CMR), Department of Land Economy, University of Cambridge. Dr Barker is also Leader of the Tyndall Centre’s Integrated Modelling programme of research and Chairman of Cambridge Econometrics. He was a Coordinating Lead Author in the IPCC Third Assessment Report (2001) and the Fourth Assessment Report (2007) for the chapter on mitigation from a cross-sectoral perspective, covering the macroeconomic costs of mitigation at national, regional and global levels in the short and medium term (to 2030). Research interests are in GHG mitigation policy, large-scale computable energy-environment-economy and world energy modelling. He has directed and co-ordinated many large projects building and applying large-scale economic models of the UK, the European Union and the global economy. He has edited or authored some 12 books and 100 articles and papers. The Centre’s objectives are ‘to foresee strategies, policies and processes to mitigate human-induced climate change which are effective, efficient and equitable, including understanding and modelling transitions to low-carbon energy-environment-economy systems.’ The Centre aims to be at the forefront of research in the area of climate-change mitigation through technological change induced by use of economic instruments, such as the EU’s emission trading scheme, applying a multi-disciplinary approach and informing national and international policy-making. The research is organised around energy-environment-economy (E3) econometric and simulation modelling at UK, European and global levels. This article is based on a presentation by Dr Barker at the ECG’s 2008 Distinguished Guest Lecture and Symposium ‘The Science of Carbon Trading’.